Shikoku is blessed with verdant nature thanks to the Seto Inland Sea, which provides the perfect climate for many plant species. Each passing season on the island finds a new flower in bloom, and visitors can enjoy myriad types of flora on their visit, not the least of which is the ever-popular sakura cherry blossom. Native to Japan and China, this flowering shrub can be found growing between rocks on riverbanks all over the Japanese mainland and in western areas. 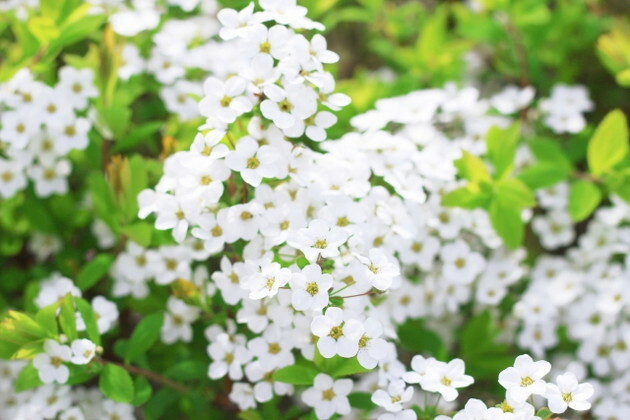 It is characterized by the small white flowers that bloom along stems during its flowering period; the flowers' resemblance to snow dusting the stems gave it its Japanese name, Yukiyanagi. With fifteen species in East Asia and three in China alone, the rhododendron has a strong presence in Asian landscaping and is a beloved ornamental in Japan. 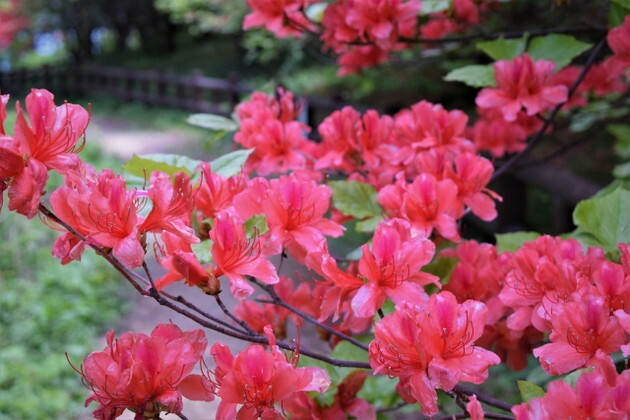 Well-known for its shocking red flowers, the rhododendron has become increasingly popular in recent years, and is a favorite in public spaces and parks. In some areas, the leaves also unfurl at the same time as the flowers bloom, so the contrast between stately green and bright red makes for an especially beautiful sight. Lupines mainly come from Western North America, with some species being found in South America, South Africa, and the Mediterranean. 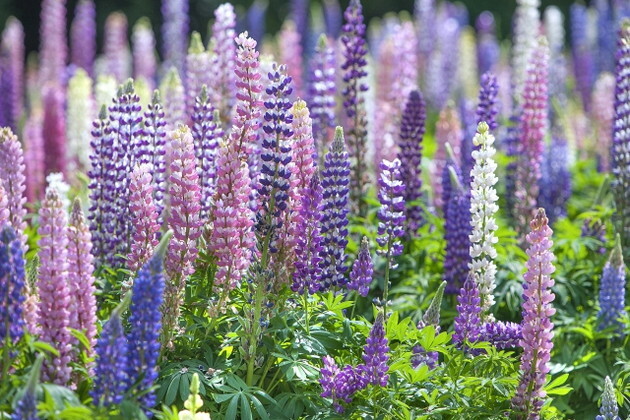 Used long ago for both food and fertilizer, lupines were brought to Japan in the Meiji period. Today, they are cultivated for their beauty rather than function. In cold climates, their roots hibernate and they can be grown as perennials, but lupines don't handle heat well, so they are usually annuals in warmer climes. 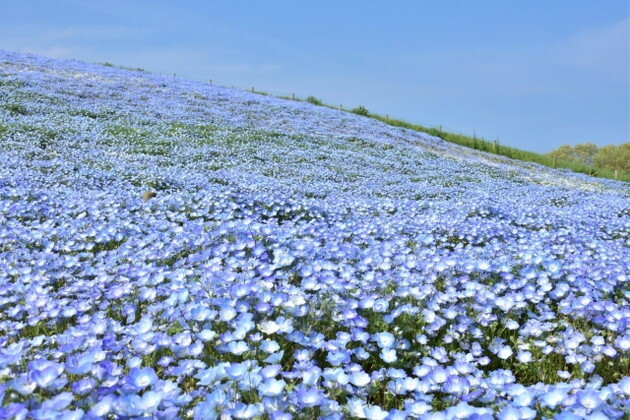 There are ten known species of Nemophila native to North America, and they are annuals that wither soon after their flowers bloom. Their clear, blue flowers are like fairy sprites with their impish charm, and they are often used in spring flower arrangements and planters. Their leaves are ornate, and the plants naturally cluster for luxurious growth. Native to Europe, these beauties are also known as Rainbow Flowers because they bloom is such a riot of color. 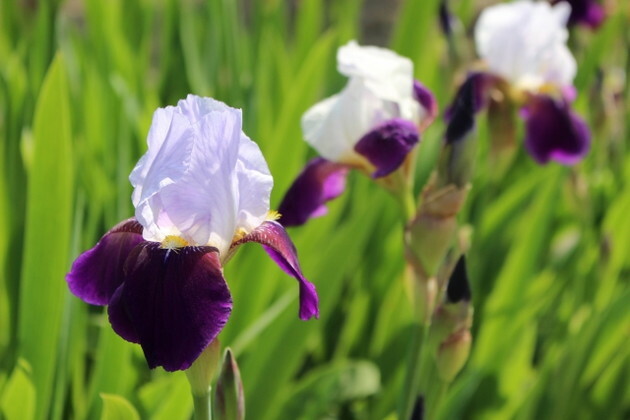 With many different varieties, it is perhaps the most showy of the iris family. With both solid-colored flowers and duotone/variegated, German irises are indeed the most fashionable of seasonal blooms. 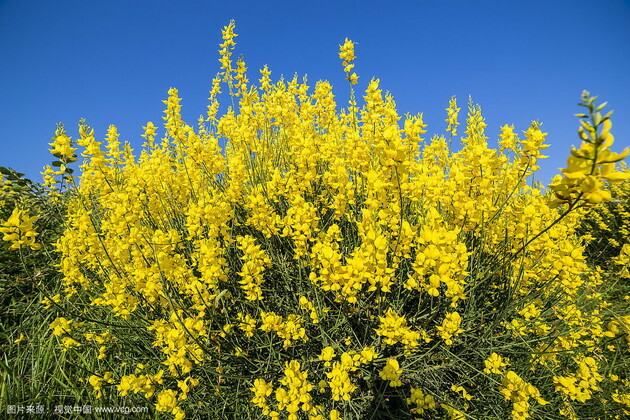 Hailing from Southern Europe and the Canary Islands, Spanish broom can now be found in many of the world's drier climates. With its sweet-smelling yellow blossoms, its essential oil is often used in perfumes. 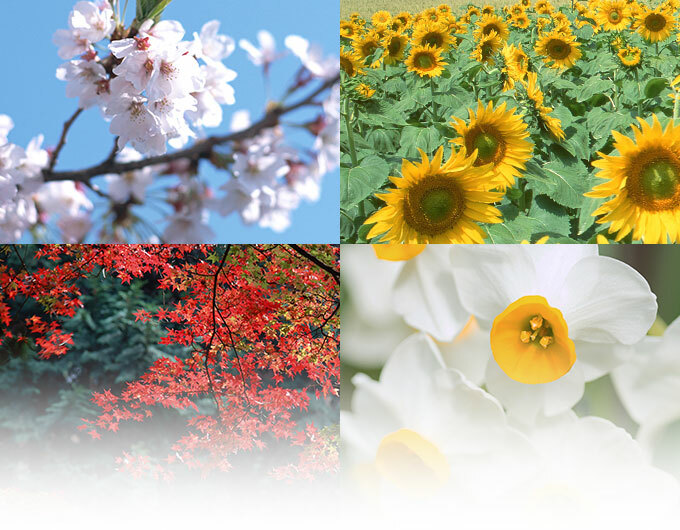 The flowering period is quite long, with blossoms continuing to bloom in succession. It is popular in both arrangements and dry in potpourri. 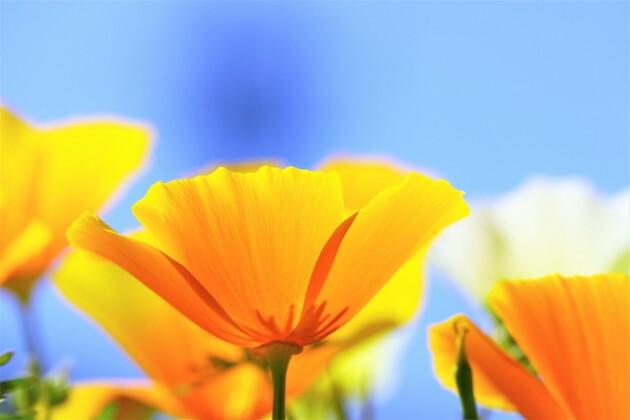 Native to the California and Oregon coasts of the United States, the California Poppy was brought to Japan during the early Meiji period. The bright orange flowers resemble the red cups traditionally used for drinking Japanese sake, and they are easily spotted even from far away. During daylight hours in the flowering period, they create an orange carpet across the ground, but at night (or in the rain), they close up. Originating in Europe, this annual is delicately sweet with its thin petals, so like washi (Japanese) paper. Lately, double blossom varieties have come into favor. 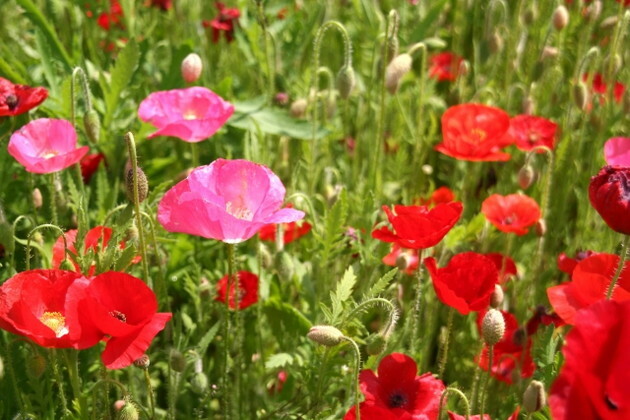 From spring to early summer, the stems grow tall, and then their large flowers bloom. The flowers come in reds and pinks, and also white. The buds point down forlornly before blooming, giving the flowers a shy charm greatly appreciated in Japan.